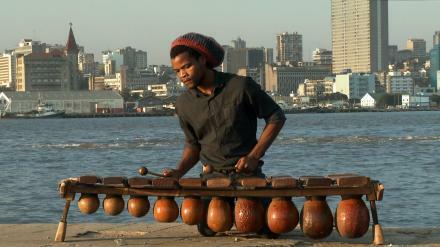 Matchume ZangoOver the last five years, Walter Verdin has been filming the traditional musical culture of Mozambique, which has been on UNESCO’s Intangible Cultural Heritage of Humanity list since 2005. Timbila Tracks is a patchwork of this music and of new compositions based on Verdin’s video recordings. The concert includes a live performance by Matchume Zango, a young Chopi timbila player and percussionist. The video film includes footage of the eighty-year-old bandleader Venancio Mbande playing music with his sons and talking about culture, music and politics. Mbande will be in Brussels to talk about the musical culture of the Chopi people and about the dilemma between cultural authenticity and the adaptation to new and different cultures.